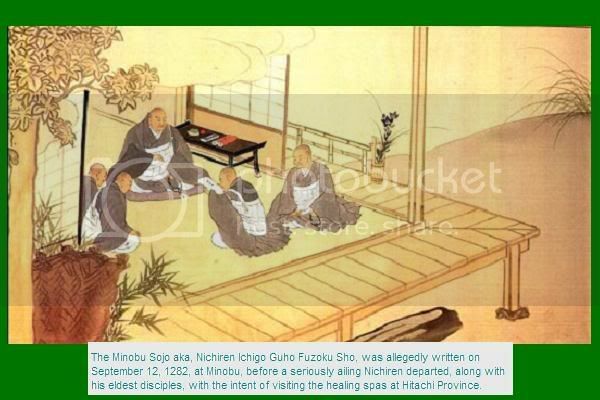 The Minobu Sojo aka, Nichiren Ichigo Guho Fuzoku Sho, was allegedly written on September 12, 1282, at Minobu, before a seriously ailing Nichiren departed, along with his eldest disciples, with the intent of visiting the healing spas at Hitachi Province. That was a little more than a month prior to the Shonin’s passing. There are no originals of the Minobu Sojo; SGI presently claims that it was lost, along with the “Ikegami Sojo”, during a military conflict, in 1581. According to SGI, the oldest known extant copies were recorded by Nisshin (1508-1576). of Yobo-ji temple, Kyoto. The earliest specific reference is in the Hyaku-gojikka-jo, written by Nikkyo (1428-1489? ), at Taisekiji Temple in 1480. It appears that the content varied among the versions known to have existed; and each supported some unique claim made by the Fuji lineage temple where it surfaced. I transfer this Dharma, which I, Nichiren, have propagated throughout my life to Byakuren Ajari Nikko. He is to be the supreme leader for the propagation of Honmon. When the sovereign accepts faith in this Dharma, the Kaidan of Honmonji Temple must be established at Mount Fuji. You must wait for the time to come. This is what I call the Actual Dharma of the Precept. Above all, my disciples must uphold this document. We could sift through various sources and attempt to ascertain when, where, how, and why the various versions surfaced. This is interesting work, and I hope to sort some of it out, someday. We could also address the argument that Nichiren would have named a “sole” successor, and that Nikko was the best choice. However, these are really “Red Herrings,” as far as determining the authenticity of the so-called Minobu Transfer. For that, we need only look at the authenticated documents that address the same issues. And luckliy, there are several of these. We lack complete English translations of some of them; but there are enough excerpts available, that we can make a fairly informed judgement. Hi, Robin, and thank you for today’s entry. I know that once I started doing my own reading, my perspectives really changed. The whole idea of Nichiren putting all his eggs in a single human basket seemed simply out of character for him. Having undergone so many persecutions himself and having been threatened with death, transferring to one old man and one old man alone would have been foolhardy. Hi Robin. Thanks for this. I’m wondering (please pardon my ignorance on the subject), but do you know if there has been any kind of concerted effort to confirm the authenticity of all of the letters by both Nichiren and the six priests either through handwriting analysis, carbon dating or other means? I know that different sects hold different letters and would most likely not submit to such an effort, but I’m wondering if there’s been anything done at all? It seems to me that it might put to rest a lot of claims of lineage (and could also destroy the legitimacy of certain sects). I have read different views on that. I think there had been some effort, but I lack a good source to know for certain to what extent it was successful. The consesus seems to be the ones I exerpted are considered reliable, except as noted. I do not know how reliable the translations are though. Even when there is no original, it is hard to tell a forgery from a good faith copy. Also, I do not think anything that is kept at Taisekiji has been physically examined by outside scholars. I look at each letter on a case by case basis, and try to find out what the evidence is and views are. We also, I think, have to accept that any findings are tentative. There is always a chance of better evidence surfacing. Meanwhile, we work with what we have, keeping in mind the three proofs. Two questions: first, what is your opinion as to why the SGI, which is so intent on distancing itself from Nichiren Shoshu, cling so tightly to this obviously ambiguous transfer doctrine? Is it because if they don’t, it will no longer designate the SGI/NS lineage the pure, exclusive path intended by Nichiren? And will that also put the other Nichiren schools on an equal footing? Don’t hold back on us here. Second: I remember reading in the World Tribune (about fouthree-four years ago) that Nikken, himself, made a comment doubting that the Dai-Gohonzon was actually inscribed by Nichiren, because there was such an obvious difference in the calligraphy of “it” and other authenticate Nichiren mandalas. I recall that Nikken’s comments were absolutely ripped in to shreds by PI (I believe) as idiotic, insipid, and further proof of Nikken’s heresy. What do you know of this statement/incident, and what is you opinion of the difference in calligraphy styles, beyond the obvious varations of Nichiren’s inscriptions? It appears that Taisekiji, as of the passing of Nikko & Nichimoku in 1333, may have still owned two original Nichiren Mandala Honzon(s). One would have been the Three Piece Paper Original (Shihon) Man Nen Ku Go Dai Honzon. This was written in December of 1274, and issued to Nikko the following year. There is a letter, allegedly in Nikko’s hand, transferring the Dai Honzon written in 1279, and kept at Taisekiji, to Nichimoku. The 1279 date might be an error by Nikko. This letter could refer to the Man Nen Ku Go Dai Honzon written in 1274. It is the only authenticated Nichiren Mandala Honzon bearing the words ‘Dai Hon Zon’ (Great Fundamental Object of Contemplation}. The other likely early Taisekiji Gohonzon is a Daimandara Honzon written by Nichiren in 1280, and given to Nikko’s disciple Nichizen. This is one of a number of original Nichiren mandara honzon (s} bearing the inscription Dai Mandara (Maha or Great Mandala). This Nichizen fellow was one of Nikko’s 6 elder disciples, who resided at Taisekiji. The others were Nichimoku, Nikke, Nisshu, Nissen, and Nichijo. Nichizen was a central figure in the Shakubuku activity and subsequent persecution at Atsuhara in 1279. There was second group of Nikko’s disciples in residence at nearby Kitayama Omosu Temple. They were Nichidai, Nichicho, Nichido, Nichimyo, Nichigo, and Nichijo. These latter 6 are also referred to as Nichimoku’s disciples. After Nikko and Nichimoku passed away, Nichidai was named Chief Priest at Kitayama. However, he was forced out a few years later, by the Land Lord (Jito), and replaced by Nichimyo. Nichidai then founded what is now Fujisan Nishiyama Honmonji, which is apparently independent at this time. Meanwhile, there was a nasty succession feud at Taisekiji, between Nichido and Nichigo. Kitayama apparently supported Nichido. Nichigo eventually left and founded the Hota Myohonji Temple circa 1342. The Object of Worship at Hota is none other than the paper Shihon Man Men Ku Go Dai Honzon dated 1274. Hota Myohonji is also independent at this time. Given all this, it appears logical that the Nichizen Daimandara of 1280 was retained by Nichido at Taisekiji, and may have even been the Chief Object of Worship as of 1342. In 1467, Nichiu, then the Taisekiji Chief Priest, left on a propagation tour. Upon his return in 1472, deputies had apparently sold Taisekiji and its relics, including the Temple Mandalas. This almost certainly included the Nichizen Daimandara. The Mandala carved in Camphor Wood, currently in the Kaidan at Taisekiji, may also have been sold at this time. Or, finding himself unable to find the Nichizen, Nichiu might have acquired a Wooden Copy. According to the infamous Kawabe Memo, and other sources, the Daimoku, signature, and seal on this Ita (Plank) DaiMandara appear to have been traced from one of the Daimandara inscribed by Nichiren in 1280. However, strangely enough, the transmittal or conferral date is 1279. Kitayama temple says it received the Nichizen Dai Mandara in 1539. It had been purchased on the open market by a wealthy Samurai. The Samurai donated it to Kitayama. A former Taisekeji Chief Priest, Nissho, purchased the Nichizen DaiMandara from Kitayama, sometime between 1889 and 1922. It was kept at a Taisekiji branch temple in Tokyo, until about 30 years ago, when then Reverend Abe brought it to Taisekiji, for safe keeping. According to the Kawabe Memo, the Nichizen Dai Mandara has trace marks indicating that it was transferred to wood. The dimensions, Daimoku, Signature, and Seal of the Taisekiji Ita DaiMandara exactly match the Nichizen Daimandara. I do not know if the Nichizen DaiMandara is in the Gohonzon Shu or not. Reverend Abe also said some of the inscriptions could have been the hand writing of the 6th HP Nichiji and/or the 9th HP Nichiu. the ‘Hokke Koshu’ or Dharma Flower Fraternal Lay Assemblies that sprang up in the Fuji area after 1333. These assemblies apparently used Board Mandalas as Honzon. So perhaps the 6th HP Nichiji and/or the 9th HP Nichiu had this Ita Mandara carved for their Altar or Honmon no Kaidan? There is a third Fujisan Honmonji, located at Yokohama-Shi. It is the Head Temple of Honmon Shoshu. They have a red pine wood Mandala that is a copy of the Daihonzon of 1274. It has an eye opening (Kaigan-mei) inscription on the back. The Eye Opening is dated October 12 1279 and bears Nichiren’s signature and seal. It first appeared in public during the 20th Century. Honmon Shoshu claims this is the actual DaiHonzon dated 1279, that was transferred from Nikko to Nichimoku. This folder can be accessed by npx members for private use only. Members can only view the 3 X 5 screen sizes (this is fairly new yahoo policy). Those with moderator access can also view the larger, full size versions of the photos. He might have meant the three section paper Great (Go) Honzon (Shihon Dai honzon) of 1274, which was entrusted to him in 1275. This must have been kept at Taisekiji since Nichigo took it with him when he left there for Hota circa 1242. Of course, Taisekiji & Yokohama-Shi Fujisan Honmonji have different theories; of which the latter is only slightly more credible. Yokohama-Shi Fujisan Honmonji (Honmon Shoshu) argues that the 1274 Shihon Daihonzon is known as Man Nen Ku Go, but these words are not found on the three section paper original mandala kept at Hota. They are found on an eye opening inscription on the back of their wooden copy dated 1279. I reject the notion that any specific mandala has any special powers. Also I reject that possession of a mandala gives a temple any special authority. inscribed a secret mandala, to enshrine once the Emperor took faith? 1. Is it possible that a very old Nikko (84) got dates of events that happened 50 plus years earlier wrong? Or could the document have been altered by Nichiu? 2. Does Nikko really write Dai(Go)Honzon in the 1330 document, as on the 1274 mandala, or is it Daimandara; as on the 1280 mandalas, and translated as Daigohonzon? 3. Was Nikko entrusted with another known mandala from 1279? 4. How did the 1274 Dai(go)honzon come to be known as Man Nen Ku Go? (For Humanity’s Salvation and Protection for Ten Thousand Years.) Was this written in a Gosho? 6. Is there any significance to the detail that Nichiren wrote ‘Daihonzon’ on the 1274 mandala, rather than ‘Daimandara’, as on the 1280 and other Ten Worlds Mandalas?